My blanket dress has morphed into a jumper. Not that that means it is going to look any different. Probably the biggest question I had when deciding to make my Irish blanket into a dress instead of a skirt was “how practical is this”? A sleeveless “everyday” dress for Winter? It was a given fact that I would be wearing a cardigan sweater with it, but I wasn’t sure I could find a suitably hued sweater to go with the bold plaid of the blanket. I had visions of taking up knitting (which I still should do…) in order to get the correct sweater match for this dress. And then, last week in the Style section of The Wall Street Journal the lead article was entitled “How Dresses Lost Their Sleeves.” The sub-caption was “Women Want to Cover Their Arms Comfortably, but Designers Say That is Asking too Much.” It seems that many designers consider sleeves to be “frumpy”. Apparently, it is “so tricky to make a flattering sleeve that is roomy enough to offer a full range of motion.” (I can’t help but insert here a MEMO to current designers: take a hint from styles in the ‘50s and ‘60s. Sleeves were often designed in two pieces to create extra give without bulk, many sleeves had two or even three elbow darts to add ease of movement, and of course, kimono and dolman sleeves were stylish and their roominess added to the overall look of a dress or coat.) But – back to the sleeveless dress dilemma. The three solutions offered in the article are, of course, first, pairing that sleeveless dress with a cardigan sweater; second, wear a coordinating blazer or jacket with the dress; and third, “layer a thin T-shirt, turtleneck, or blouse under the dress – taking care to choose a neckline that looks graceful with the dress.” Of course! This solution makes the dress into a jumper! The term “jumper” conjures up visions of school uniforms, little girls’ attire, and bib aprons for many people, but for me, it reminds me of a look I have always loved and enjoyed wearing. 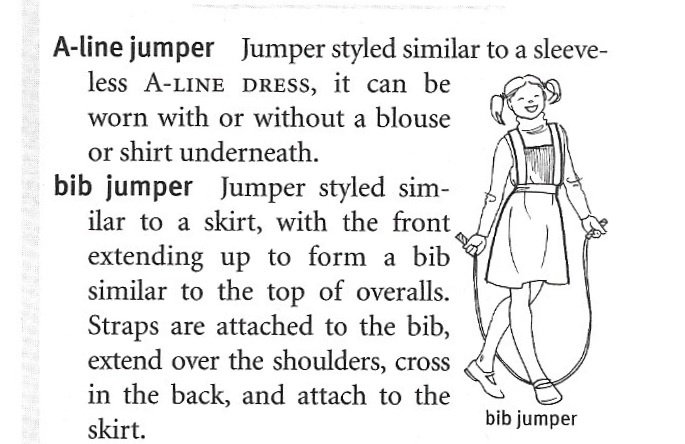 This entry from The Fairchild Dictionary of Fashion, Third Editiion, Fairchild Publications, Inc., New York, New York, 2003, defines various types of jumpers, including the A-line jumper. 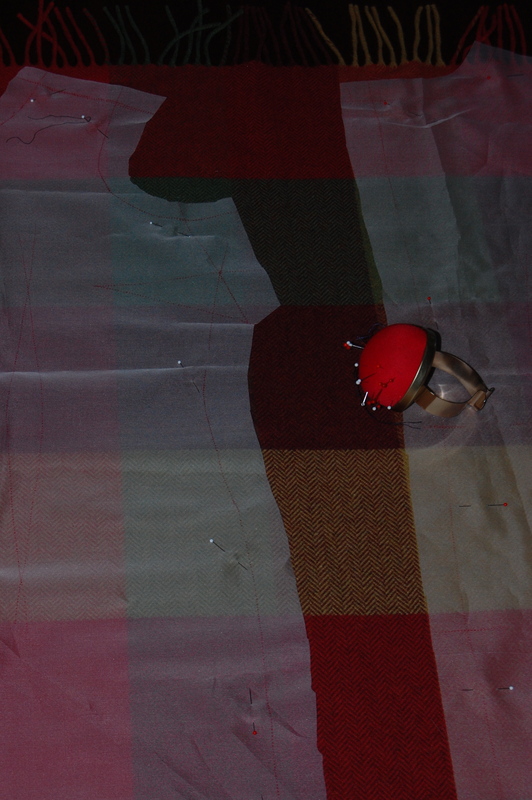 About the time I was reading this article, I had already cut the lining for my blanket dress. 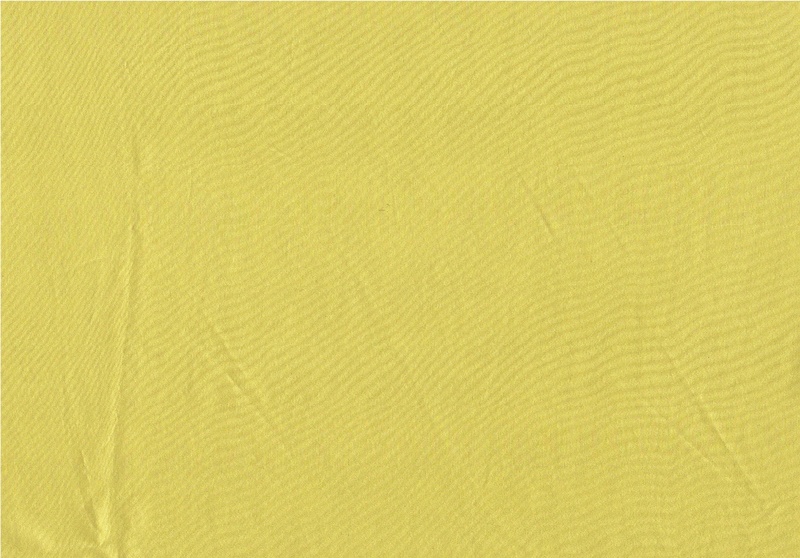 I had (very proudly, I might add) found some yellow crepe de chine in my fabric collection which I knew would be perfect for the lining. Not only did this mean I would not have to buy another piece of silk, but this particular color of yellow also had a slight brownish-greenish tinge to it, making it a pretty and pretty perfect complement to the plaid of the blanket. Not sure the real color of this silk comes through here, but it’s close! And that’s how my dress turned into a jumper. Talk about frumpy! But seriously, how frumpy can a fringed-hem jumper be? I don’t think it will be, but I guess we’ll see for certain after the “ensemble” is complete. In the meantime, I’ll share the details of the finished jumper/dress . 1) I used brown thread to sew the fashion fabric, and it blended in beautifully. 2) The dress is underlined in white silk organza. 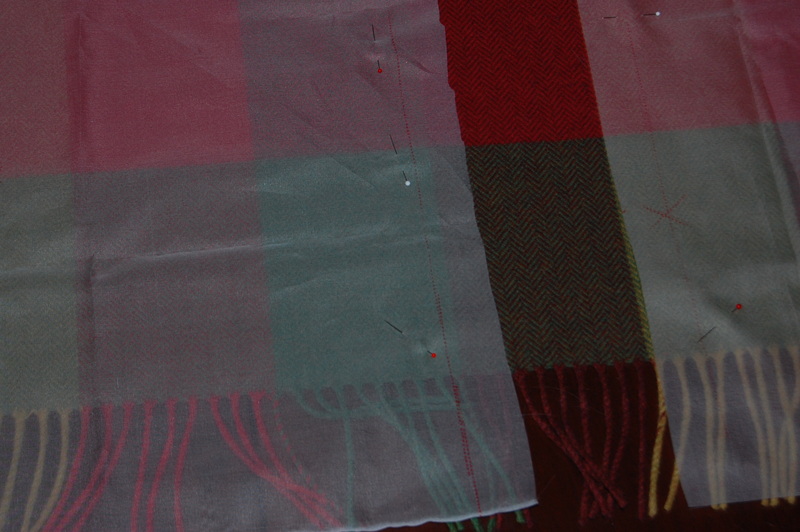 Here are the silk organza pattern pieces arranged on the fashion fabric. I cut the silk organza the full needed length of the dress in order to know exactly where the fringe should be placed for the hemline. I trimmed the organza about an inch from the beginning of the fringe and catch-stitched the edge of it very carefully to the fashion fabric. The tight weave of the blanket allowed me to do this without stitching or pulling showing on the right side of the dress. 3) I cut the armholes a little deeper than I would for a sleeveless dress, in order to accommodate the sleeves of the still-to-be-made blouse. 4) After trying it on to check the fit, it felt funny not have more weight at the hem other than the single layer of fringe. So I got the brainy idea to double up the fringe if I had enough left in my scraps. I wasn’t sure how I was going to do this, but I thought I could somehow figure it out. 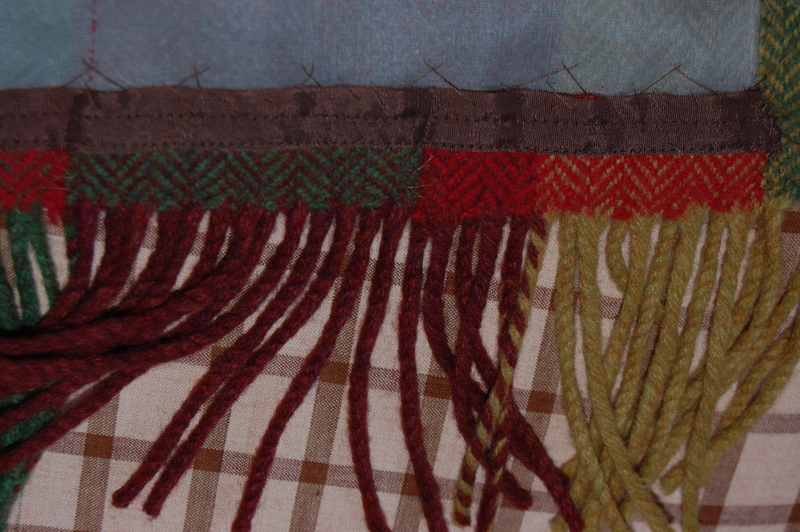 Sure enough, with piecing and matching, I had enough fringe to add another layer directly underneath the existing layer. When I found a long piece of brown rayon hem tape (vintage, no less, complete with rusted pin holding it all together! ), I knew I had a plan. I stitched the pieced sections of fringe onto the rayon tape, and then hand-applied it to the dress. First I attached the upper edge to the lower raw edge of the silk organza , and then carefully slip-stitched along the “hem” edge to make the two layers of fringe act as one. 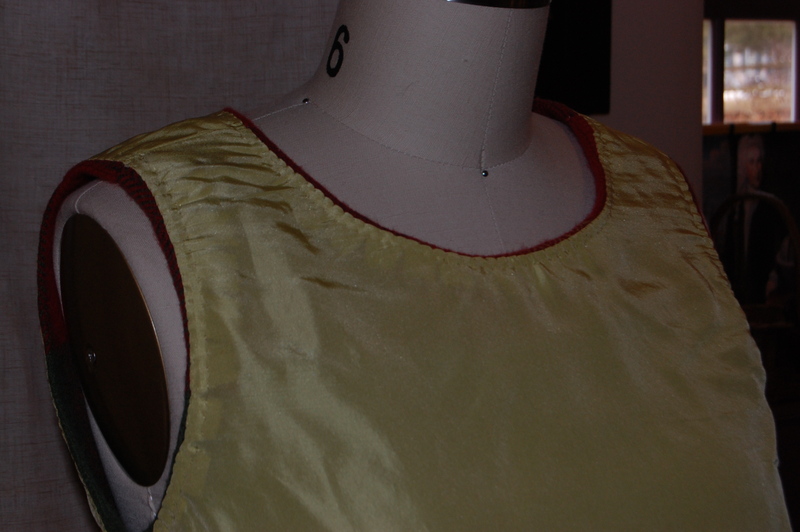 5) Of course you already know the dress is lined in yellow crepe de chine! 6) I saved the label from the blanket and sewed it into the back neck edge, so I’ll always be reminded of our lovely trip to Ireland when I put this on! I guess on really cold days, even a blouse may not be enough to keep arms warm. I just may have to be really frumpy and wear a long-sleeved silk under-shirt underneath it all. Or maybe I really should take up knitting? I love the dresses you make. They’re interesting, so finely sewn, very stylish, sophisticated, and wonderfully feminine. Thank you so much! I get a great deal of pleasure out of my fashion sewing, and the fact that people like you enjoy seeing and reading about my dresses adds immeasurably to it. 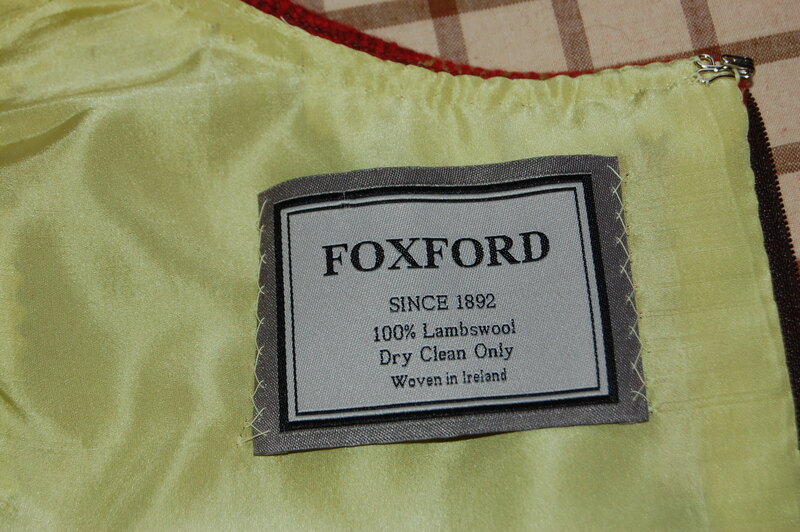 Lovely to see the finished dress/jumper made up from the Foxford. Thank you, Maria! 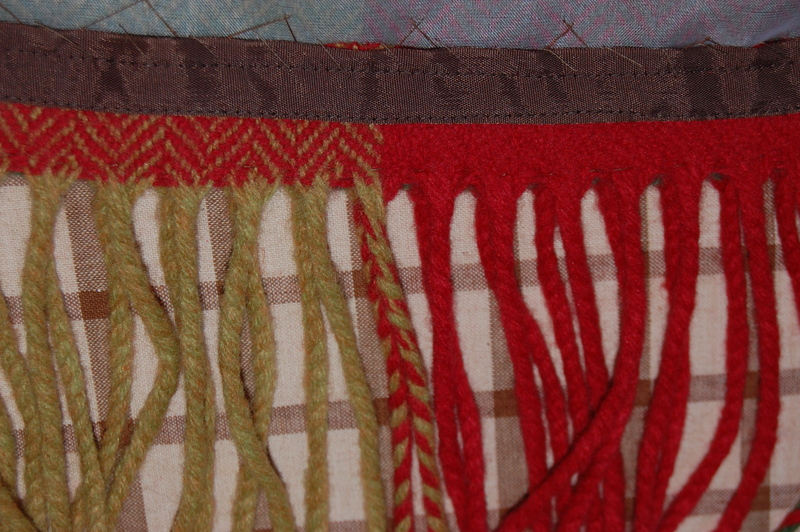 It’s wonderful to be inspired by beautiful fabric as I was with this wool blanket! 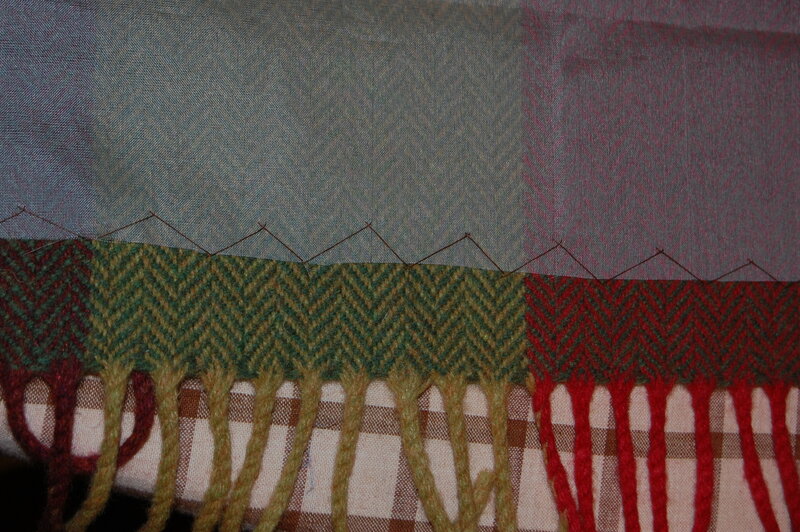 If one row of fringe is good, then two rows have to be even better, right? Thanks for your lovely comment! Not frumpy at all! You have made a unique designer dress. Lovely! Thank you, Linda! I can’t wait to wear it! Be careful with that knitting plan. The next step is that you can’t find yarn with the right “feel” so you take up spinning. Then the dye isn’t quite right so you take up dying to match. Before you know it, you have sheep running around in your back yard! Lovely jumper. Another solution? I love making knit tops for my jumper out of wool knits (of the same weight as a smart wool undergarment). Cute. Slim fitting. Perfect Match. And no knitting involved! Your comment has given me many a good laugh! I think you are right that knitting would open a whole other “can of worms…” But it might be time if I can keep the sheep corralled! Lovely! A true one of a kind dress with beautiful memories stitched into it. Your memo to current designers is spot on! Thanks, Marianne! I am sure current designers could learn a thing or two from those of us who sew fashions! Wow, what a beautiful job you did with that dress! My mom used to wear things like that in the 60s to teach high school, often with a blouse with a bow. Didn’t Audrey Hepburn wear something similar in Sabrina, with a boatneck top under, so just the knit sleeves stuck out? Eileen Fisher has a light roll-neck merino top on their website, which could work under it, too. And I completely agree about needing sleeves! I think one reason they’ve been jettisoned is that they’re hard to manufacture in a hurry, and sleeveless tops fit more people. I think these retailers need to get hip to the fact that the 55+ Boomer women are the only ones left in the U.S. who have disposable incomes to buy clothes. No wonder we’re sewing! Amen! And why would we boomer women want to buy clothes that don’t suit us? Much more fun – and rewarding – to sew! Well, you did it again. I think the jumper idea is more suitable especially with the weather you are having. Very cute and will look good on you. You always take me down memory lane with the clothes I wore and made in the past. I laughed at the rusty pin on the seam tape…I can almost swear that in my box of various tapes, I’ll be able to find a rusty pin. We’re in FL as you know and I’m going to try to create a few things with the limited stash I have with me. Say “Hi” to the Couture ladies. I love all of your projects, and that this one creates a wonderful memory of your trip to Ireland. The blanket label is perfect. Finally, yes, you should take up knitting. It is something you can do when you are relaxing in front of the TV, or visiting with friends, and it will open up a whole new world of creativity for you. I can see it now. 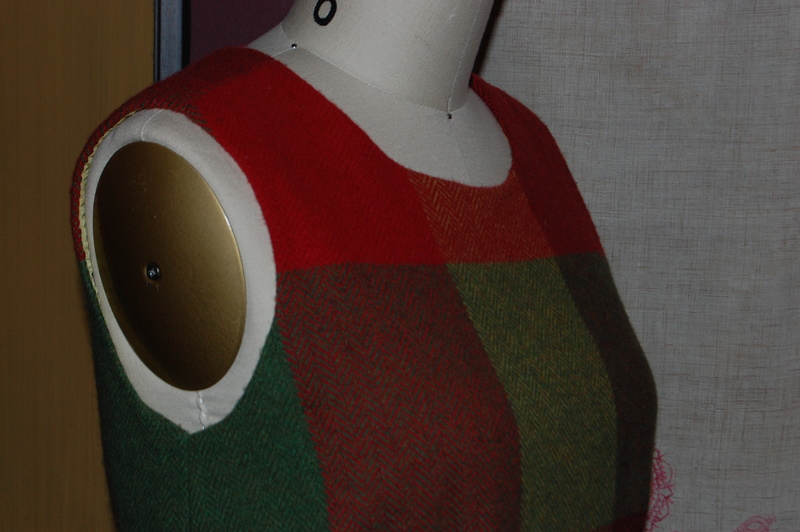 Soon you will be collecting vintage fibers and yarns, and crafting them into exquisite art-to-wear pieces. I agree, Ann! It’s time to start to knit – but maybe I should start with something simpler than a sweater!